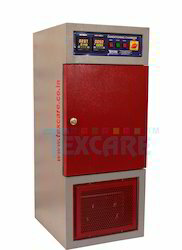 We provide a wide variety of oven, incubators and muffle furnace with high performance and durability features. These are fabricated using high-quality raw materials and exported at reasonable price. These are light weighted equipment that is widely demanded in numerous industries for heating purposes. 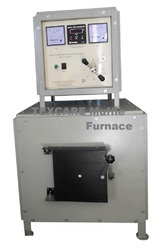 Muffle furnace is used for different test process, one among is Ash content of components. The Oven is used for aging and other related test processes. These are available in different sizes, shapes as per client requirements. Laboratory Muffle Furnace offered comprise big heating space and use of open coil heating elements on both sides of heating chamber so as to allow faster heating with minimum temperature gradient. Designed to deliver optimum performance, these are also appreciated for durable and sturdy construction finish and energy efficient functioning with lowest possible maintenance costs. With a working size of 125 x 125 x 250 mm, these are made available in maximum temperature of 1000 Deg C and working temperature of 900 C.
Inside Chamber Size 14" x 14" x 18"
Conditioning Chamber offeredcomprise Lab Conditioner that comes in double walled structure which is filled with glass wool insulation. Here, the system features inner chamber made of stainless steel with outside body made of mild steel in powder coated finish. Further, our expertise also lies in making available fully SS models that feature two adjustable perforated shelves for keeping samples as well as chambers heated with air circulating fan with heater. Further, these also feature transparent viewing window to see the samples. Double walled structure filled with glass wool insulation. Inner Chamber made of Stainless Steel and outside body is made of mild steel powder coated. Fully SS models are also available. Two adjustable perforated shelves for keeping the samples. The chamber is heated with air circulating fan with heater. The chamber is cooled electrically with the help of compressor cooling coils placed in ribs on the side of chamber. Temperature controlled by Digital Temperature Indicator and Controller. Humidity controlled by digital humidity controller. Transparent viewing window to see the samples. Light arrangement inside chamber to see the samples. Push type door locking system. We are the leading Manufacturer and Supplier of High-Temperature Industrial Hot Air Oven. 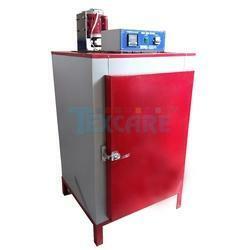 High-Temperature Industrial Hot Air Oven is used for special purpose application at High Temperature. This type of oven used in most of the industries.